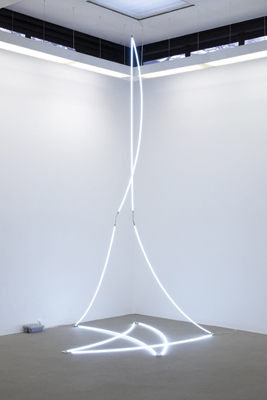 Galerie m has been accompanying the career of world-renowned French artist François Morellet ever since it began 40 years ago simultaneously with the beginning of the gallery. Morellet derives his formal vocabulary from Concrete Art, views himself as belonging to the realms of Minimal Art and Conceptual Art, and is also quoted in the context of Op Art. His oeuvre runs the gamut from panel painting and graphic art to architectural art and lighting installations, defiantly resisting all attempts at categorization. 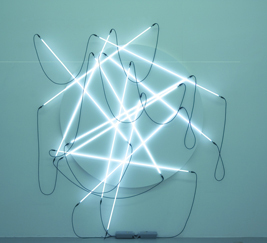 As early as the 1960s, Morellet enlisted the industrial character of neon light as a way of reducing his subjective gestural signature and developing a sober and rationally comprehensible perspective: “Because neon light is hard, pure, without shadows or reflections” (François Morellet). Instead of reflected light, the light source itself is the focus. Art objects display only what they are. Neon tubes can be arranged into clear-cut forms, wild rhythms or flowing lines in a way that can be by turns graceful, astounding or serene. 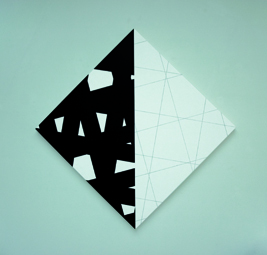 In his paintings, Morellet’s vocabulary focuses on basic geometric shapes. He breaks open and loosens these up according to mathematical laws, yet with a playful lightheartedness. Square and circle are the leitmotifs of the exhibition, continually reappearing in different guises. This confounds our viewing habits and delivers some surprising effects. For example, the artist chops up a big circle into numerous segments, putting them back together again in a seemingly random and absurd pattern. The circle is alienated. Or squares are stood on their heads, so to speak. Once we have come to the realization that behind every one of these compositions, no matter how spontaneous it may seem, there is a carefully calculated system, we feel compelled to seek out the secret code behind each work. In the process, our eyes always follow artistic rules situated somewhere between accident and order. Notwithstanding all their rational precision, Morellet’s works triumph with both their poetic aesthetic and astute humor; whether based on an ordering principle or on chance, his systems are never an end in themselves. Instead, the artist ironically undermines his own systematics – for example in the titles he gives his artworks. A neon work is dubbed Lunatic Weeping and Neonly; the image summoned here of a moody, weeping moon contrasts sharply with the geometric, minimalist look of the piece before us. The group of works exploring lines and bands is called Strip-Teasing. Here the verbal joke opens up intriguing associations; we imagine the artist both coaxing out the possibilities of and stripping bare his linear compositions. In Morellet’s world, reason and irony are closely intertwined.